Social media has already onointed unbeaten colt Roheryn as the next big thing in racing but trainer James Cummings hasn’t quite gone that far yet. Trainer James Cummings (Pic: Steve Hart). "Highly impressive'', "nice animal'', "very special'', "something out of the box'', "future G1 horse'' are some of the social media reactions to his two wins to date. The Godolphin trainer is undoubtedly a fan of the Lonhro three-year-old and says he has the makings of a very nice horse. That said, he wants to see Roheryn dispense of a handy line up, and overcome some challenges, in the 2019 Membership Sprint (1100m) at Rosehill Gardens on Saturday before placing any labels on him. “He’s still improving and it’s a pretty interesting test for him,’’ Cummings said. “First of all he has to keep doing it. I wouldn’t be labelling him as a star of the future just yet. “He has some class about him and a lot of speed for a horse that looks like 1100m and 1200m is not going to be the end of the road for him. TAB certainly has a healthy respect for Roheryn as he opened $1.70 to make it three from three. Roheryn debuted at Warwick Farm on a heavy 10 in early October and earned high praise from jockey James McDonald. Josh Parr, who rides on Saturday, took over for the colt’s second start, at Rosehill on November 3, where he scored a comfortable four length win ovr 1200m. Punters Intel data out of that win showed Roheryn is a horse with a very nice turn of foot. He ran 33.48 for his last 600m, over five lengths superior to the next best which was runner-up Ronstar (34.33), and his 10.84 from the 400m-200m was bettered only by Newsfan (10.77) on the day. Roheryn meets Ronstar 5kg worse for the four length win and they drop 100m but that’s not the horse Cummings is concerned about as a potential threat. “I would say this will be his most interesting test up against Chess Star,’’ he said. Chess Star is a Listed winner and beat the likes of Thrillster and Wild Planet, who have both performed well in stakes company in the spring, when he last raced in March. Cummings said what he likes about Roheryn, and what could take him on to bigger and better things, is his nature but that’s something that has developed with time. Exactly how good is @godolphin colt Roheryn? Chances are we'll find out on Saturday @rosehillgardens. Roheryn first trialled around this time last year and could easily have been a Golden Slipper prospect for Godolphin. “Twelve monthgs ago we weren’t happy enough with him to run him. He got a little overexcited in the paddock and had an accident and that put us out of play for a fair while,’’ he said. “He’s sensible enough now to handle his racing without it all getting to his head too quickly. “He’s relaxed in his work and relaxed in his racing and I like to see that in a horse. While Roheryn will command plenty of attention, Cummings warned stablemate Colombina shouldn’t be underestimated. Colombina ($10) beat a subsequent winner first-up at Warwick Farm, the same meeting Roheryn debuted at, but was a beaten favourite at Randwick on October 31. 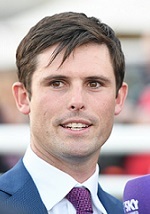 Cummings said the filly had excuses second-up, having almost come down midrace, and with just 52kg is very well weighted. “She looks like she’s going okay so with the full force of the weights there she’s capable of running well against these horses,’’ he said. Among a strong Godolphin presence at Rosehill is the promising mare Deft who has her second run back in the Australian Turf Club Sprint (1200m). Deft ($6.50) was sharp enough to win first-up at Canterbury over 1100m and Cummings will get a reliable measuring stick when she takes on the smart Seasons who opened $2.30 favourite with TAB. “She’s come back beautifully and I was really impressed with her first-up win,’’ he said.